Are you guys tired of hearing about my studio yet? I wouldn't blame you. Sadly, it may be some time (or never) before I'm tired of talking about it. I didn't want to bore you today with lots of detail pictures but you can count on seeing those sprinkled around the blog for awhile. By the way, I'm in love with this doorknob that my sweetie surprised me with while I was out of town last month! I'm now daydreaming about replacing every knob in this house. Here's a quick before of the room from the day we were here on our house hunt. This is the view from the door. The closet is to the right and a daybed to the left. A reader had asked if the table in the closet was really going to be useable for crafting. I have set up the tables for different uses and I think that is one of the things I love the most about this room now. I have a sewing area, a work area and a creative area. So far it is working great. I am on the hunt for a nice wood rolling chair to use at these 2 work tables. Here's the latest incarnation of my inspiration board. I like to redo it about once a year. It always makes me happy and inspires me endlessly. Note the new light fixture. I'm so in love with it. We put one just like it in the hallway upstairs. Here you see how the closet works with the rest of the room. The metal shelves in the niche are very functional and give me tons of storage. I think I may curtain at least some of the shelves. I'm going to be giving that 'ol sewing machine a workout very soon with plans for pillows for the bed, window treatments, a sewing machine cover and a few other surprises. This space is my dream come true. I'm not an extravagant girl, no expensive jewelery or Mcmansions for me. Just having this space to surround myself with pretty things feels like such a luxury and helps me to live contentedly. I really wish you could come play in this space with me. It's the only thing that could make it better. Would LOVE to join you in your studio! It is just gorgeous. How do you ever leave it? What a pretty space to create! Great job! The room is YOU and that's most important....what a 'happy place'! Enjoy! What a wonderful room! What is the wall colour, it's beautiful. What a great little "nest"....and I LOVE those doorknobs, now where did he find those, what a sweetheart! I love the IN and OUT knob. You made a beautiful space! It is so pretty. I could while away the hours in there!! Oh, my, goodness! JEN. I LOVE your studio! I love the knobs. I love your inspiration board! I just love it all! You are one blessed girl, girlfriend! Container store has awesome canvas (cream) zippered covers that fits that shelving. The pale green color of the room is peaceful and inviting--it makes me smile. The inspiration board is lovely. AND HEY--I like the look of the day bed, but I agree it isn't always the best place for reading! Love, love, love the inspiration board. Will you be sharing where I can find the in/out doorknob? I want! It looks so pretty! You'll have so much fun in your new space! Your talented man did a great job on the closet! Your studio is lovely! 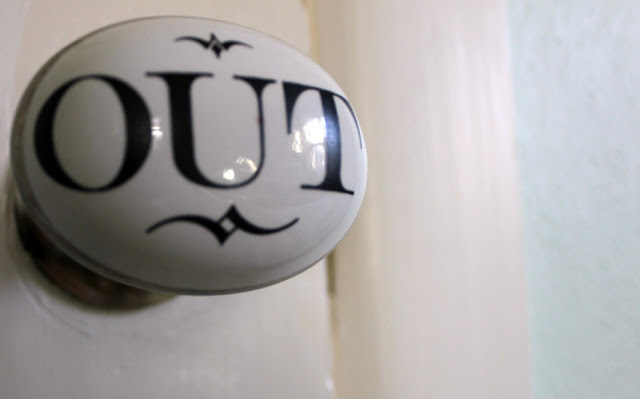 I really love the "In" and "Out" doorknobs! So cute! May I ask where you found them? Never get tired of seeing your creative space, Jen. It brings a big old smile to my face! Thank you so much for sharing your lovely space. I love seeing how others set up their rooms and always find something to inspire me. so, after you come to my house to sit on couches, we're going to your house to be crafty. is that what you're saying? cuz i'm all in. ;o) it looks spectacular, and i LOOOOVVVEE that ceiling light! gorgeous!!! so glad you finally have your room, and that it turned out so perfectly! Jen, every time I read your blog I feel I've met a kindred spirit! Beautiful space, you did a great job! love it all! you an encouragement to me to wade into my space in a get better organized....Have came to the sad conclusion I may me a hoarder....hate to get red of things I "just know" Ican creat with! I am def. a messy creater.........just remembered that there ARE hardwood floors in mine too!!! it's so so lovely jen. so excited that this dream is realized for you :) and i'd love to come join you. it looks to be an ideal place to create! What a sweet husband you have. Very unique knobs! Love your pretty room! I am "in" love with your room and "out" right happy for you! beautiful!!! may have to steal the paint color for the farmhouse! That inspiration board!!! I pinned it, I'm not gonna lie. My hubby just built a work bench for my studio and the inspiration board you created is simply amazing. what an amazing studio. you can talk about it and show pictures of it as much as you want. love it. Methinks I will be pinning your studio pics on my pinterest board, Jen! I am also now needing to go to Lowes for a couple of those lights. My 1926 cottage still has a few hideous fixtures where hubs won't put up some of my chandelier stash. Your dreams inspire us all! It looks beautiful! Love the light fixture and the paint, and the open yet cozy feeling. Perfect place to create! The closest I've come to a space similar that--my own room--was a dark room. That was so much fun, but then we moved to Newton. I have a nice niche to fix up but hubby's computer is in there, and since last March my sis's cat came to live with us. Yeah, it's not very pleasant. So my laptop follows me around the house, mostly in the spare room. You're so lucky! Love your room.